I had a productivity breakthrough, and it's not from some app, website, or methodology. It's from a practice. It's called Personal Kanban. I first heard of Personal Kanban when I jokingly told my friend Shanna that I was about ready to get a giant whiteboard and write down everything I had to do on it. She said, “there's a name for that”. 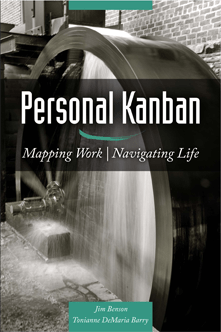 A few minutes later I was reading the Personal Kanban 101 article and that evening, decided to plunge in and purchase the book, Personal Kanban: Mapping Work | Navigating Life. Personal Kanban has to be endlessly flexible. It needs to be a system that abhors rules. It’s an enigma. A process that hates process. The authors highly recommend using a white board or some other physical representation of your work to fulfill rule one. They have lots of great reasons for this in the book, but I'd like to share my personal experience. Over the last few years, I've jumped from app to app, system to system, in search of a good “to-do” list. None of them ever stuck. To-do lists: the last bastion for the organizationally damned. They’re the embodiment of evil. They possess us and torment us, controlling what we do, highlighting what we haven’t. They make us feel inadequate, and dismiss our achievements as if they were waste. These insomnia-producing, check-boxing Beelzebubs have intimidated us for too long. And they must be stopped. I found myself in a pattern: I'd find some new great app, excitedly jump in, add all my to-do's, use it for a couple of days, and then promptly forget about it. What always did stick, was my desire to scrawl stuff down on sticky notes or whatever scraps of paper were available. The physical experience of taking abstract ideas and turning them into tangible objects (sticky notes) impacts our learning by improving our understanding while promoting memory retention and skill synthesis. The more I recognized my desire to have a digital solution, the more frustrated I became when none of them would stick. That's what lead me to telling Shanna that I was about ready to dump it all for a whiteboard. The funny thing is, I've used this type of system before. I never knew it had a name, but for some reason I thought it was not “okay” to use an analogue system. I am the Cloud Coach after all- doesn't everything have to be web 2.0 and digital? In a way, when Shanna told me that there was a name for the system, I felt like I had permission to use it. 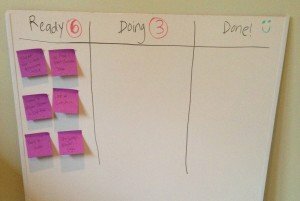 The simple Personal Kanban is a horizontal whiteboard with three columns, Ready, Doing, Done. Every time you remember that you have to do something, write it down on a sticky note. If you're ready to work on that task now, put it in your ready column. If not, it can go in some sort of backlog. When it's time to start working on a task, pull it from the Ready to the Doing column, and commence. When you're done, move it to done. It's painfully simple, but I promise if you try it out you'll get addicted to moving around those sticky notes. Now, let's not forget about rule 2- limiting work in progress. Kanban naturally helps you take care of this because you won't be able to fit that many sticky notes on your whiteboard. But the authors also recommend setting arbitrary limits for each column. As a baseline, they recommend going with a max. of 6 items in your ready column and 3 in your WIP. You can and should adjust these numbers depending on the circumstances that day. That's what's so cool about Personal Kanban. It's not rigid at all. If you are in crisis mode and can only focus on one thing at a time, then by all means limit your WIP to ONE item. Capacity: How much stuff will fit. Throughput: How much stuff will flow They are not synonymous. I've peppered this article with quotes from the Personal Kanban book, so if you haven't guessed, I'm a big fan. However, it's not for everyone. If you're looking for a very concrete set of rules that describe a new productivity system, this is not the book. All you really need to know and understand are the two rules of PK and give it a try with a simple 3 column setup. The book is more like a philosophical piece about work and productivity itself- not a system for how to get it done. I found it to be really thought provoking; all along reassuring me that my own version of this system would be the right one for me. Do you need the book? No. You can learn how to use the system for free by reading PK 101 and trying it out for yourself. However, if you want to get your hands on some seriously inspiring and intelligent writing about workflow, capacity, productivity, and work-life balance, this is it. Like traffic, work does not fit. Work flows. I'd love to hear about your system for tracking what you need to do, how you get it done, and whether or not your system is working. 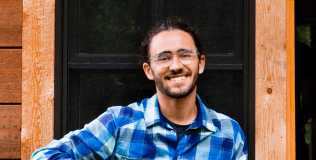 Have you tried out Personal Kanban? Want to? Don't want to? Join the conversation below!